During 2019, The Checkered Flag will be rounding up the news and results from the various TCR Series around the world on a weekly basis. This weeks review includes The ADAC TCR Germany Series, The TCR Japan Touring Car Series, The TCR Australia Touring Car Series, The TCR UK Touring Car Championship, The TCR Eastern Europe Touring Car Series, The TCR Europe Touring Car Series and The FIA World Touring Car Cup (WTCR). Just outside Turin in Italy, BRC Racing Team held the launch party this week for their assault on the 2019 World Touring Car Cup (WTCR). During which, two sub-teams were launched by the outfit in order to comply with the WTCR’s new-for-2019 entry quotas. BRC Racing have split their resources across two separate teams for this year, ensuring that they can still run a quartet of Hyundai within the regulations of the competition. 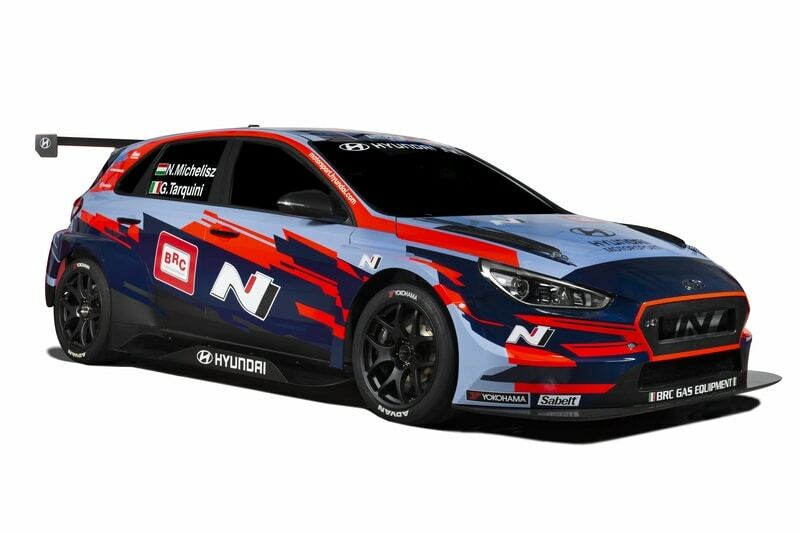 BRC Hyundai N Squadra Corse will see reigning WTCR champion Gabriele Tarquini once again partnered with his 2018 team-mate, Norbert Michelisz. The Squadra Corse will race in the predominantly blue livery, which has been widely hailed as an improvement upon the cars’ 2018 appearance. The remaining two cars will compete under the ‘BRC Hyundai N Lukoil Racing Team‘ banner, with Augusto Farfus and Nicky Catsburg making their debut in WTCR this year. As a driver, this new venture into the UK motorsport scene will see Huff develop his management and coaching skills instead, as one of the primary figures behind the new Teamwork Huff Motorsport outfit. The announcement also ensures the return of Volkswagen to TCR UK in 2019; the marque which dominated proceedings last year in Great Britain. In order to have the team operate at the highest level, Teamwork Huff Motorsport engineers will receive technical support from successful British Touring Car Championship outfit, Ciceley Motorsport. Eastern European teams and drivers will have plenty of opportunities to run their TCR cars from the current season onwards, as the WSC Group has signed a licensing deal with promoters of both the TCR Eastern Europe Series and the ESET V4 Cup. The two series will merge into the 2019 TCR Eastern Europe Trophy powered by ESET that will be run over five events at the Hungaroring, the Red Bull Ring, Grobnik, the Slovakiaring and Brno. The opening races in Hungary, taking place during the WTCR weekend, will see the TCR Eastern Europe Trophy powered by ESET competitors joining the same grid of the TCR Europe Series, but with their own classifications and podium ceremonies. TCR Eastern Europe will come to an end with a sixth event at Monza, together again with TCR Europe. Oettinger, a well-known name for tuning and running Volkswagen cars in different motorsport categories, will field two Golf GTI cars in the 2019 ADAC TCR Germany Series. The programme will be run in cooperation with Engstler Motorsport with 2018 TCR Asia Series runner up Mitchell Cheah and Dutch driver Maurits Sandberg who was a regular in the German series during the last two seasons. “The ADAC TCR Germany is one of the most interesting Touring Car championships in Europe, and, with the entry of the Volkswagen Golf GTI cars, it is ideal for us to go chasing quick lap times,” said team principal Rüdiger Völkner. “We are excited about this cooperation and are certain that, together with Oettinger, we have a great season ahead of us. Mitchell Cheah was already successful for us in TCR Asia and will now participate in his first German series,” added Kurt Treml, Sports Director at Engstler Motorsport. Two Renault Mégane RS TCR cars will join the growing grid for the inaugural TCR Australia Series; they will be entered and prepared by Garry Rogers Motorsport, which is expanding its involvement, having previously confirmed it will run two Alfa Romeo Giulietta Veloce cars. The drivers of the GRM-entered Renault cars will be confirmed in the coming weeks, while the cars are expected to arrive in Australia next month. Hong Kong-based KCMG announced its plans to run a Honda Civic Type R FK8 in the all-new TCR Japan Touring Car Series and the Super Taikyu Series. British driver Matt Howson has been signed for both campaigns and he will be joined by team principal Paul Ip and former Formula Renault Asia champion Jim Ka To for the Super Taikyu events. Howson and KCMG have a long-standing and successful relationship, having competed in the FIA World Endurance Championship together for four seasons, scoring five LMP2 class wins including the 2015 Le Mans 24 Hours. Belgian motorsport powerhouse, Team WRT, have recently held their 2019 season launch party. During which, they unveiled the liveries that their World Touring Car Cup (WTCR) and TCR Europe teams will be competing in this year. Starting off with their WTCR team, Jean-Karl Vernay and Gordon Shedden will be racing in slightly different looking cars compared to last year. Most noticeably, the turquoise colours of title sponsor, Leopard energy drinks, feature more prominently on the 2019 cars. This comes as a result of no longer having to share the canvas with fellow sponsor, Lukoil, who have decided to invest in the BRC Hyundai project this year instead. As for the TCR Europe Touring Car Series, the team’s visual appearance is much different as the squad will be representing two marques in this competition. WRT will run an RS3 LMS TCR for Uruguayan newcomer, Santiago Urrutia. Maxime Potty also returns to the team after a year with Comtoyou Racing, however, the Belgian youngster will continue to compete in his Golf GTI TCR this year.